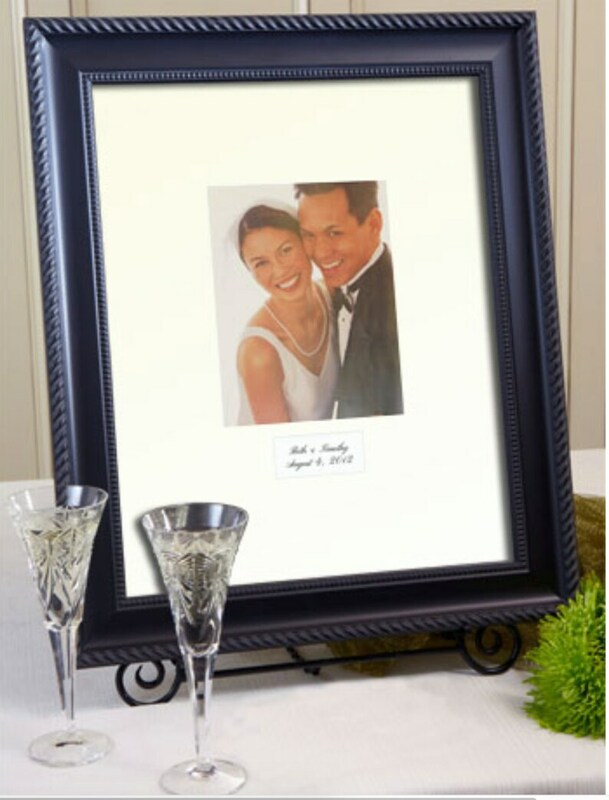 A Signature Frame is a unique replacement for a guest book for your wedding or special event. Sometimes called an autograph mat or autograph or signature board, unlike a traditional guest book, this won't end up in a drawer! It's a keepsake that will remind you everyday for years to come of your very special day! The Signature Mat can be personalized or not personalized, comes in white or ivory. Please add Personalization text in Comments. We recommend no more than 2 lines: Bride's Name & Groom's Name, Ceremony Date. A Signature Mat is an excellent alternative guest book for weddings, anniversaries, birthdays, baby showers, bridal showers, retirement parties, class gifts or any special occasion. This comes with a beautiful, black, elegant rope frame. As with all our Signature Frames, this 2 1/4" wide frame comes with a white acid-free, beveled cut mat and holds your choice of a 5"x7", 8"x10", or 11"x14" (20"x24" only) photograph. The Frame, Mat, Backing, Hanger, and 2 Black Gel Pens are all included. We offer our Signature Mat in two sizes 16”x20” and 20”x24”. Please select which size and photo cutout you would like. You may choose a personalization area on your mat. It is the 2" x 4" block cutout under the photo cutout. Your personalization will be printed on the archival paper in black ink. For weddings, we recommend 2 lines: Bride's Name & Groom's Name, Ceremony Date. You may choose from Cardo and Pinyon font styles. Please specify your text and font in the instructions when you place your order.